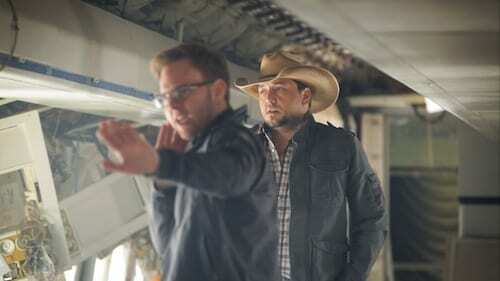 Wes Edwards and Jason Aldean on the set of "Flyover States." Jason Aldean toasted youthful rebel rousing and the scars it leaves behind in recent hit “Tattoos on this Town.” And he teamed with longtime director Wes Edwards who took the sentiment one step further in the music video. When coming up with the treatment, Edwards wondered, “What’s the ultimate thing you could leave behind? A child.” Penned by Michael Dulaney, Wendell Mobley and Neil Thrasher, the lyrics don’t depict the video’s storyline of a young couple whose marriage is cut short when the man dies at war, before the birth of his son. “Nothing in the song makes you think of the storyline of the video,” continues Edwards. “That’s how I make videos interesting. I find the thing that might add something to the experience.” It went on to earn Edwards his second nomination for ACM Video of the Year. He was nominated along with producer John Burke. Since first working together on Aldean’s 2005 debut video, “Hicktown,” Edwards and Aldean have risen through the ranks simultaneously. Back then Edwards, a Franklin, Tenn. native, had just landed at Ruckus Films, where he continues today. He had earned a television production degree at MTSU and spent four years gaining traction, including time as an editor at Ground Zero. “I thought it was going to be easy to direct music videos, which was the most naive thing ever,” he recalls. It’s worked out well, with Edwards earning his first ACM Video of the Year nomination for Aldean’s “Amarillo Sky.” The director explains, “In ‘Amarillo Sky,’ everything in the lyrics makes you imagine that it’s an old man driving the tractor. But I thought, ‘What if it’s a young guy and what if they’re not characters?’” So Edwards interviewed farmers in their real houses, wearing their own clothes and shot footage of the aging, rusted equipment in the cornfield. “It was borderline documentary, and that really resonated,” he states. He strives to keep the fresh ideas coming by not getting bogged down in watching other videos, and by working projects outside the country genre. “I don’t watch other country videos,” he says. “I don’t want to compare my videos to other videos, and I don’t want to get stuck in a pattern.” Recently Edwards expanded his portfolio by making three videos for trance artist Dash Berlin.